The Backpack is constructed with waterproof 600D Nylon material. With 3 detachable pouches attached on front and two sides. Large cargo with a big compartment in it. With a bite valve hole at the top of the pack, and hided by a cover. Come with a hand carry strap and adjustable shoulder strap. Wide & thick waist belt, comfortable for heavy carry. 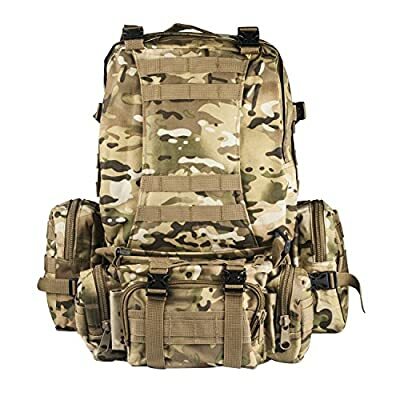 Made of 600D Nylon material Compatible for pouches and attachments Adjustable shoulder strap, chest belt and hip belt for heaving loading One main bag with 3 detachable molle pouches attached on front and two sides Great ideal for outdoor activities: camping, hiking, trekking, traveling, etc.